Come on Japan, keep to the left. Is that too much to ask? In Japan it is customary for vehicles to use the left side of the road out of common courtesy to other motorists. This custom has become widely accepted due to its inclusion in the Japan Traffic Act, large fines and the possibility of death for not doing so. Now, I grew up in a country with a well established car culture. In my home country children ride in cars from birth onwards, and almost everyone learns to drive when they're 16 years old, sometimes earlier. One fact so widely accepted that they don't even bother quizzing you about when you go for your driver's your license is that vehicles use the left hand lane. Essentially from birth your brain is being conditioned accept the keep left rule. In Japan, on the other hand, not all children are ferried around in cars, my own children ride in cars just a few times each year. Also, a much smaller percentage of the population hold driver's licenses. Of those that do hold licenses many do not drive on a regular basis, these people are known as paper drivers. As a result a large proportion of the population haven't been conditioned to or learned about the generally accepted keep left rule. Often I'll be cycling, on the road, on the left, only to almost be involved in a head on collision with an approaching cyclist who is not only riding on the wrong side of the road, but often reading/sending mail, talking on their phone or holding an umbrella. These people annoy me primarily because I am always the one forced to take evasive action which involves swerving further out into the lane. But what disturbs me more about this practice is the number of times I see adults with a young child in the child seat or an older child on a bicycle trailing behind. They're not only risking a serious accident on this single trip, but also conditioning their children to believe that cycling towards traffic is an acceptable thing to do, thus increasing the likelihood of an accident in the future. Its not only cyclists, as a jogger I'll run on the left side of the path only to have someone running towards me on the right try and barge right through me. As a pedestrian its a little more complicated, as a lot of the time you're forced to move with the crowd. But in less crowded areas can't you please walk on the left, or at the very least walk in a straight line? Another quaint custom in Tokyo is that of standing on the left when using an escalator, leaving enough space on your right for those in a hurry to walk up. But go to Osaka and this is reversed, stand on the left and you're just getting in everyones way. To add to the confusion our local station was recently upgraded to a shiny new building. When approaching the stairs there are signs and arrows indicating "keep to the right here". Yet on the escalators everyone stands on the left, as is generally accepted! The lack of standardization is doing my head in! 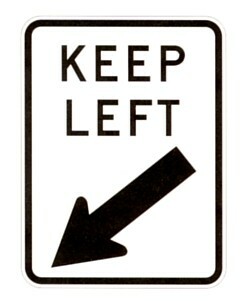 Come on Japan, as a country can't we standardize on a general keep left when moving policy? Is it just me or do people cycling, or waking on the "wrong" side annoy the hell out of you? More so when they glare at you as if you're in the wrong for not getting out of their way. Or am I just becoming a grumpy old man? Seems like I'm not the only one bothered by this. 1000 Things About Japan and Team Keep Left are with me on this one. You hit the nail on the head mate. I too feel your frustration and now practice defensive "riding." I can't trust the mamachari cyclists. I never could understand it when a cyclist riding just behind me on my left speeds up and passes infront of me in order to make a right (forcing me to brake - my front wheel inches from his rear) when he could just slow down a bit and make the right turn behind me. Or how about when they make a turn without even looking to where they're turning to? I agree that it would be best if everyone agreed to ride the same way, but I have an insight into where these people are coming from. I grew up in the country (in various countries) and in many places it's considered safest for cyclists to ride facing the oncoming traffic - you can see them coming and they get your main light to tell them to steer clear. I believe this is the rule for horses too in some places. Obviously more important on pitch black country roads, but then again Tokyo roads are often the equivalent.